Stonecutters Lodge close to Dullstroom and Lydenburg in Mpumalanga is a 3-hour drive from Gauteng and 1.5 hours from Emalahleni (Witbank), Middleburg and Mbombela (Nelspruit). This secure scenic property is ideal for small conferences, exclusive management meetings, strategic planning sessions and team-building. Day conferences are also catered for. The company has a BEE Level 4 and has been graded 4-Stars in the Lodge catergory by SA Tourism Grading Council. The conference facility is well equipped, including high definition data projector for big screen projection of presentations, videos, DVDs and DStv. Up to 20 delegates can be seated in a variety of configurations. The office can provide, photocopying and printing as well as email facilities. The walled garden terrace off the boardroom is an ideal tea or lunch area. There is a built in braai here and double doors lead from this garden into The Cats’ Whiskers Pub with cosy fireplace and TV. There is a selection of varied team-building activities to choose from. With the excellent waters available at the lodge, a fly-fishing clinic with expert tuition can be arranged including a competition with prizes. Stonecutters has hosted numerous blue-chip businesses from various industries. Groups of up to 20 delegates are assured of exclusivity and personal service from management and staff. 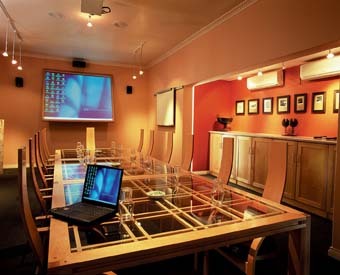 This superb small conference venue is only 2.5 hours from O.R Tambo International Airport. Please contact the lodge for further information and quotations can be tailored to your needs.